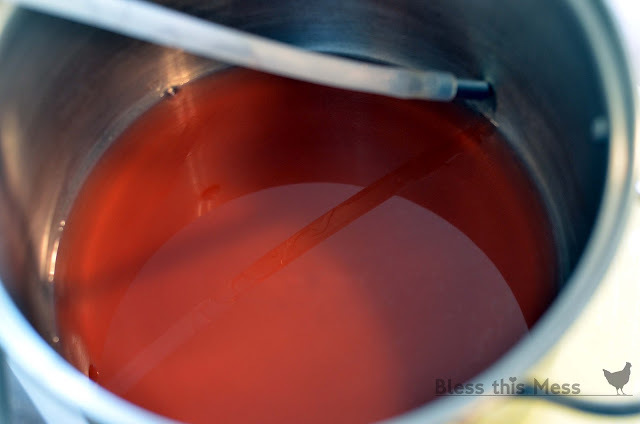 Quick and easy tutorial on how to make homemade cherry juice with a steam juicer. 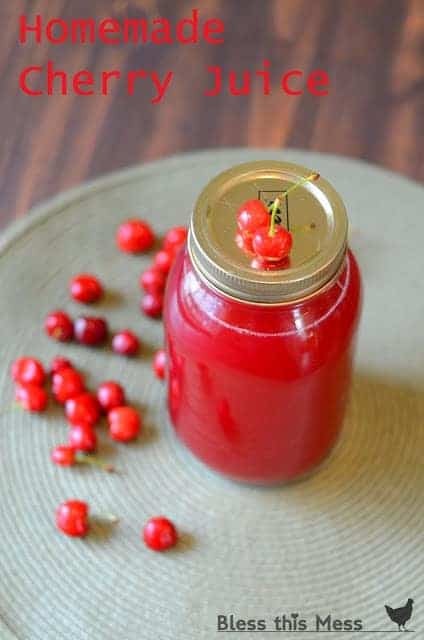 We love homemade cherry juice and use it all winter long. As I mentioned before we had a bumper crop of cherries this year. I dried some, made preserves and jelly with others, but still had gallons and gallons left. An easy way to use all the cherries was to juice them. There is very little work involved with steam juicing; you don’t even have to remove the pit! The juicer is totally worth the monetary investment if you own a cherry tree or grape vines. 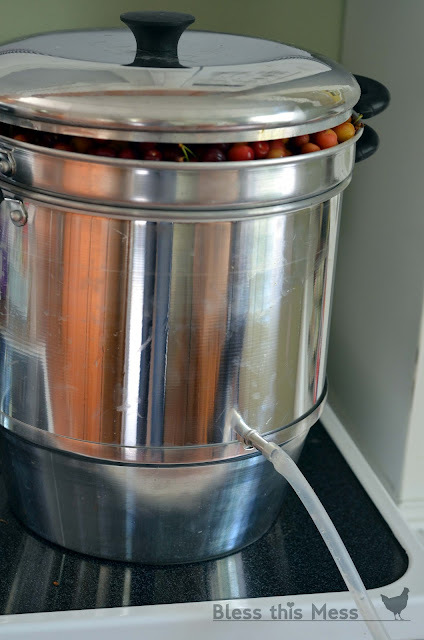 We love making homemade cherry juice and homemade grape juice with out steam juicer each year. 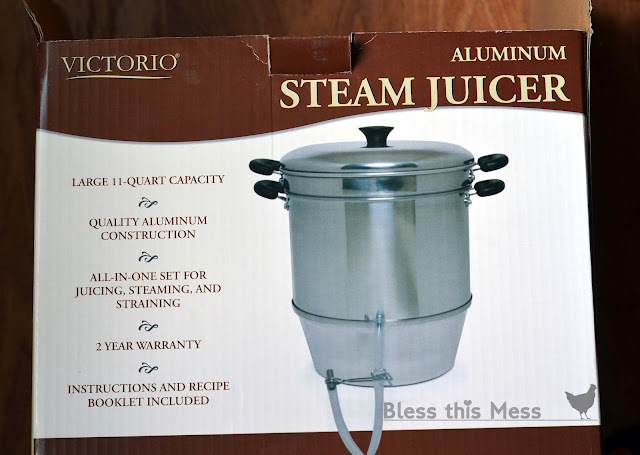 I first used a steam juicer a few years ago when I borrowed one from a friend to make grape juice. I’ve used hers for years and now that we’ve moved hours from her, it was time to buy one of my own. If you’ve never seen or used one, then I’ll enlighten you. 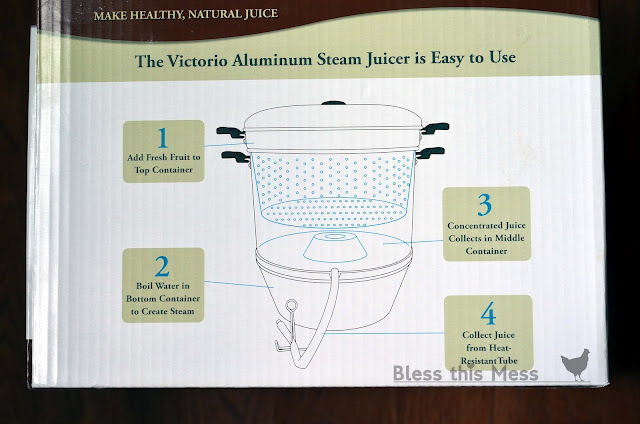 They are amazing things that are easy to use, clean, and a great way to use lots of fruit.>We bought a Victoria steam juicer for around $70 from Ace Hardware (I know IFA and other places that sell canning supplies have them). You can also buy them on Amazon. The stainless steel juicers have really come down in price and you can buy a stainless steel version for not much more. I’d get the stainless steel if you can, it’s supposed to last a lot longer and there’s some interesting reading on how the use of aluminum in cooking might affect your health. That’s my two cents, but I have used both aluminum and stainless steel and they both work great. And this explains how it works. Boiling water on the bottom comes up through a hole and then goes through lots of little holes in the basket the fruit sits in. The steam releases the juice that collects (where #3 is pointed) and it runs out a tube. Grandma’s Bing (red) and Queen Anne (pink) cherries ready to juice. 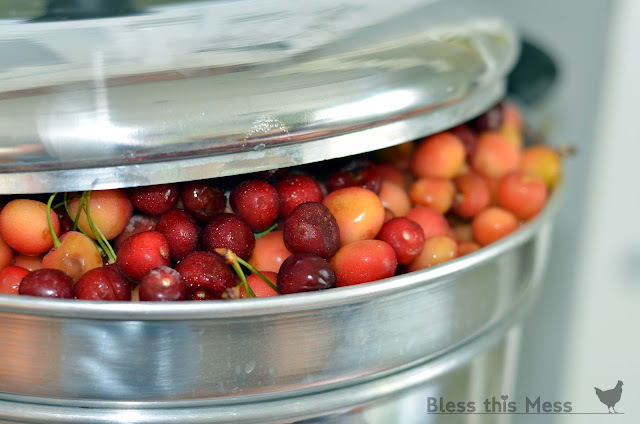 Canning is so fun, rewarding, cost savvy, and messy! If you are new to it, get a book! I recommend the Ball Blue Book; it is an all-inclusive master on the topic and only costs about $6. It’s not hard to learn and most older folks that you know will be more than willing to let you borrow some of their supplies if you want to try it out. This post isn’t all you need to can the juice (if you have never done a hot water bath), but the library will have all that info, so go find it! Adjust the time you process your juice according to your altitude. If you don’t want to can/bottle your juice, it freezes well too. When you are ready to use your juice, sugar can be added to the juice to make it sweeter; just add to taste. Sometimes we like to mix the juice with lemon-lime soda pop for a fun (and pretty) punch for parties or popcorn and movie nights. I used the juice to make cherry jelly and cherry syrup! Both are delicious. 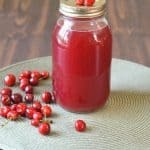 I made a tart cherry juice a few times too using tart cherries and it’s also great for all of the above recipes/ideas. I like to use it in my smoothies in the morning too as it has great anti-inflammatory properties. Fresh hot cherry juice collecting in a pot. Wash and sort your cherries, no need to pit of remove stems. I do like to pick out the ones that are rotten and any leaves that might get mixed in. Get the steam juicer washed and set up according to instructions. Fill the hopper with your cherries. If you are using more than one type, mix them as you add them. Let them steam for an hour, making sure the bottom doesn’t run out of water. The hopper full of cherries produces about four quarts of juice. If you have more cherries to do, throw out (compost or feed it to your chickens) the steamed cherries before doing your next batch. Process the juice in a hot water bath for 15 minutes (for quarts) for us high elevations and 10 minutes for you low-lyers. Sugar can be added to the juice to make it sweeter; just do that to taste. I used the juice for jelly and cherry syrup! Recipes to come. See! 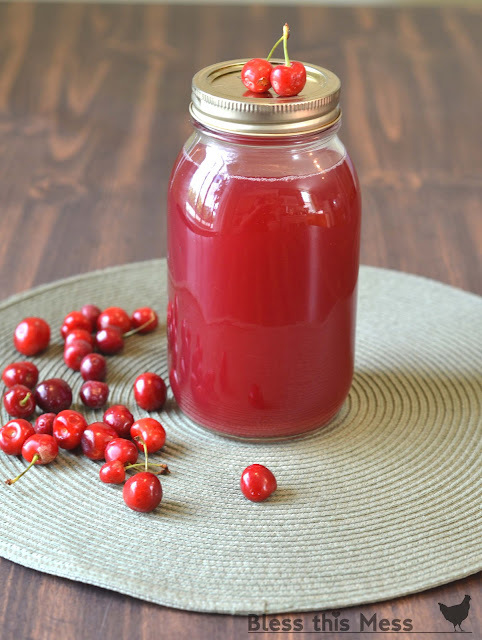 It’s not hard to make homemade cherry juice in your own kitchen. With a load of cherries, the right supplies, and a little time, you’ll have more than enough cherry juice to last all winter long. Nothing tastes better than opening a bottle of summer in the cold of winter! 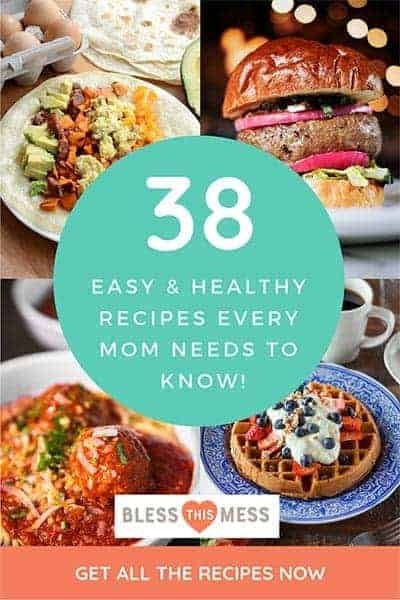 The recipe was originally published in July 2012. It was updated, rewritten, and republished for your enjoyment in July 2017. Beautiful!! These are such beautiful photos and I wish we had such plentiful cherries!! so our cherries always have worms so we dont use them. do you think it would be bad to juice cherries w/worms? i want to get a pitter and dehydrate them, but they always stick to the dehydrator. hints? That cherry juice looks delicious! I had never heard of a steam juicer, so I appreciate the info. 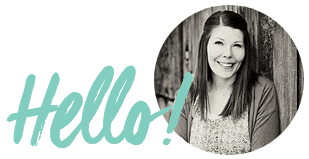 Thank you so much for linking up at The Prudent Pantry. I will be featuring this post soon! Love the photos! 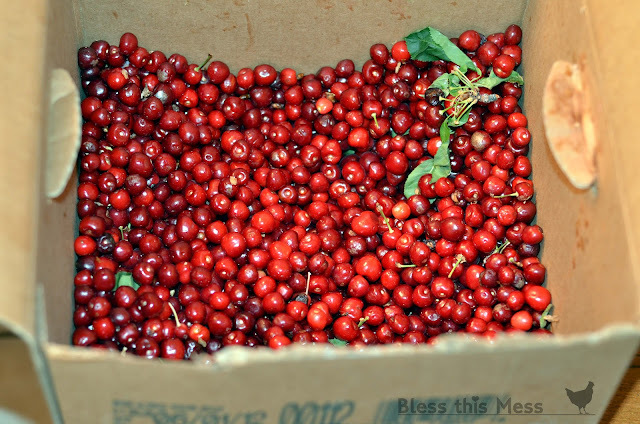 Living in the Traverse Bay Farms area of Michigan, I get to pick my fresh tart cherries right from the cherry trees. Only a few more weeks until the 2013 harvest…I use the same juicer my grandmother used when she made her cherry juice. We have just moved to Trav City and have access to LOTS of tart cherries. How much sugar do you add per quart of tart juice? Do you can the juice in jars or bottle it? The sugar depended on the batch… I think we would dump in the jar of juice and then add about 1/2 cups of sugar and maybe a cup or so of water. Often times we would add the juice to Sprite for a fun drink for a party and it was delicious! I canned the juice in a hot water bath like you do jams and jellies. Good luck and congrats on living in cherry country! what does it do to the nutritional value of the juice since it is very hot? I plan on trying to make juice from tart cherries but I’m unsure of the method. Thanks for your thoughts, it looks so pretty! Melissa, there isn’t very much information on preserving tart cherry juice, so I was very happy to find your site! Just received my victorio steamer, but wanted to know if you steamed your cherries not only with pits in, but steams too? I have 4 cherry trees that have put out more cherries then ever this year! I had lots of stems mixed in there too, so they aren’t an issue when it comes to steaming the juice!